More photos of my '54 Esquire! Discussion in 'Guitars in General' started by Lewguitar, Apr 28, 2016. 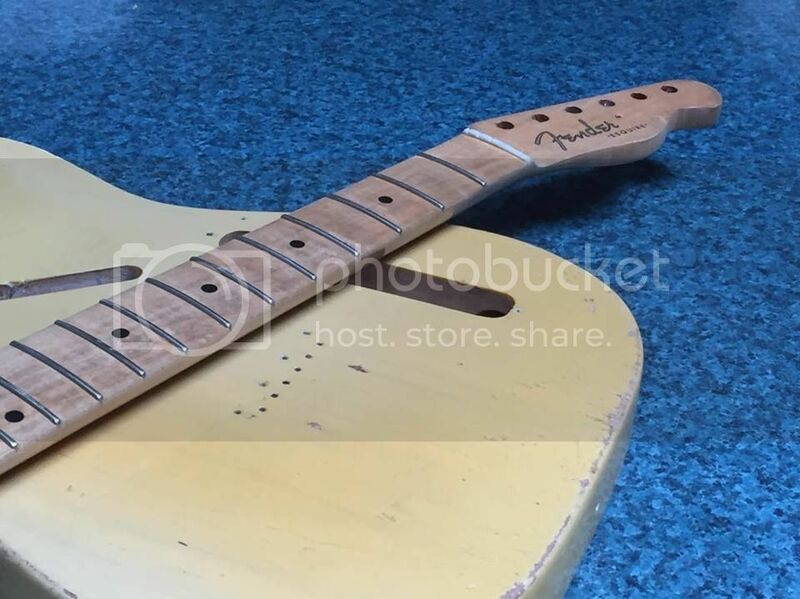 Dawn at Naked Body Guitars has been working on my '54 Esquire for about a year now getting the refinish just right. She's ready to ship it back to me and I'm super jazzed to be getting it back again. It's my oldest guitar and I just love it. She sent me some new photos of the beautiful refinish and relic job she did. 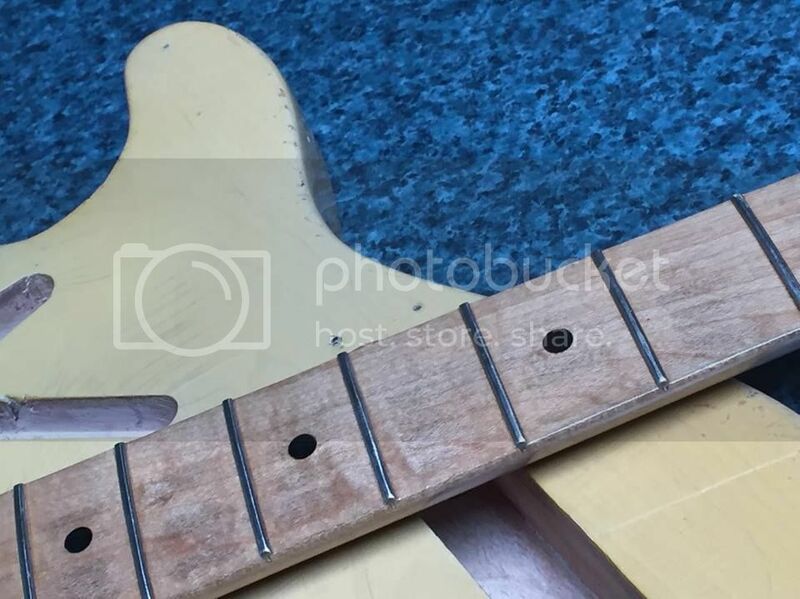 To me, this is a restoration because at some point in the guitar's past it must have looked a lot like it does now...before some knucklehead stripped it and refinished it with candy apple red bicycle paint. I have all of the original parts except for the original '54 pots and tone capacitors. 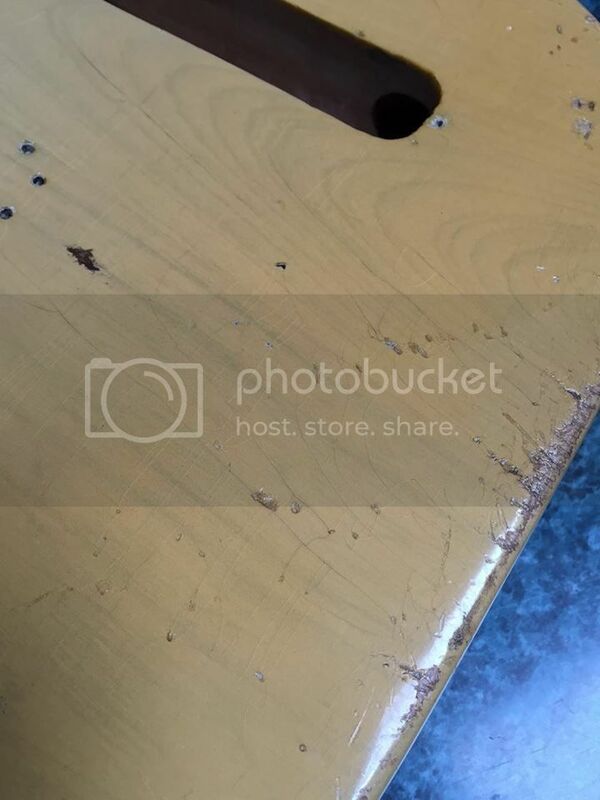 Even have the original ashtray bridge cover and pickguard. enharmonic, Bob Pollock, SPROING! and 7 others like this. When I bought it, someone had installed a black bakelite pickguard with a very old Seymour Duncan Tele neck pickup. I already had a '57 Esquire pickguard that I'd owned for years. Exactly the same pickguard this guitar would have had originally. I always played it with the neck pickup mounted in the guitar. Now I have to decide. 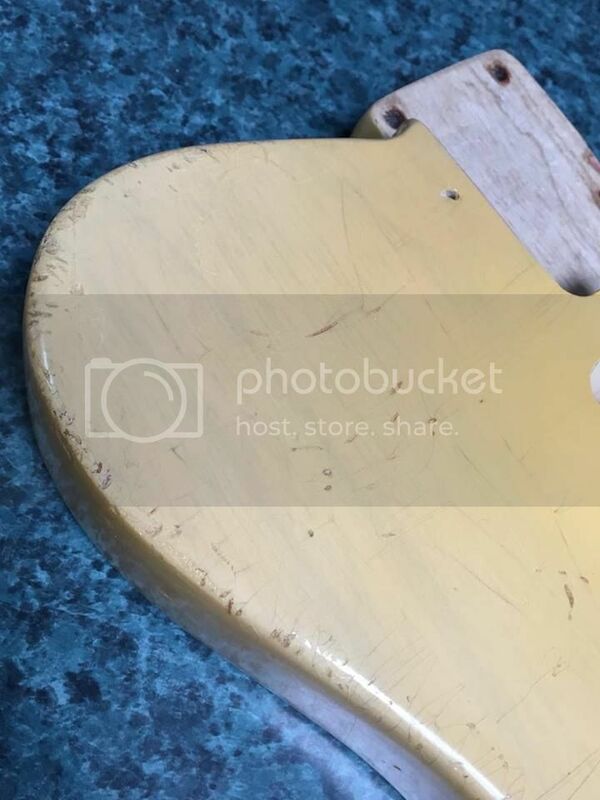 Do I use the original white Esquire pickguard and not have a neck pickup? Or do I keep the white pickguard in the case and go with the black bakelite one so I can have a neck pickup? 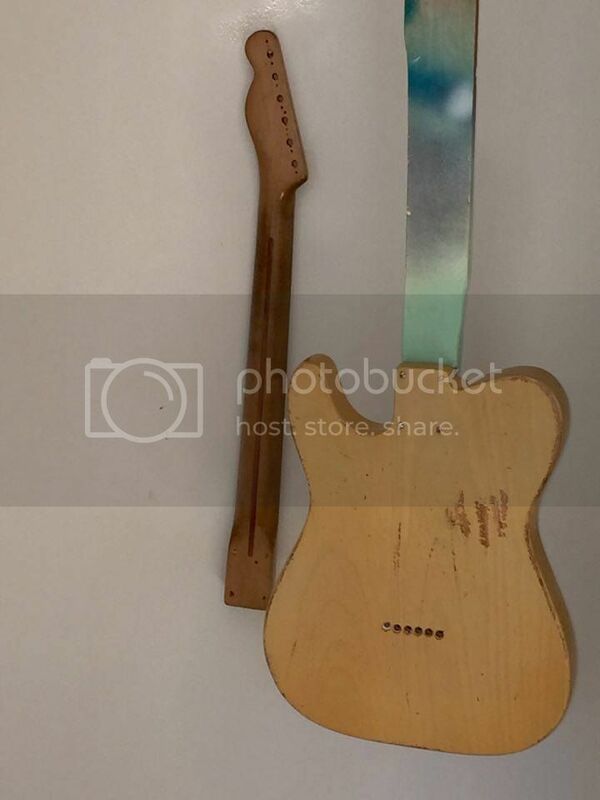 I'll probably put it together as an Esquire and shoot some photos...then install the black bakelite pickguard and neck pickup again so I can enjoy playing it more. Bobby D and BMX like this. I would go with the black and have a neck pup. That thing looks amazing BTW. Looks amazing and I too vote for the neck pickup option but only because I love neck pickups so much. IRG and Lewguitar like this. I would go with the black guard and neck pickup as well. Makes it more versatile for gigs. How big is the neck on that vintage T? Fender put very thick necks on the 54's. But they're still 1 11/16" at the nut. Another vote for the neck pickup option. Usability trumps historical accuracy any day of the week. An original '54 Esquire should have had a black pickup and only one pickup, correct? '54 was the year they switched to the white guard so a '54 could be either black or white guard. I have everything except the original pots and caps. Even have the original 3 way switch. I played it for about 20 years with the Duncan as the neck pickup and I do prefer a Tele to an Esquire. I prefer the black Bakelite pickguard too. If I ever sell it I'll sell it with the original white pickguard and just the original bridge pickup. Yep. And mine is right on the cusp. Bob Pollock, SPROING! and Lewguitar like this. Don't think so. Altho I prefer that look. Try it as an Esquire, with the bridge pickup only. You'll be surprised how different it sounds compared to a Tele config with a neck pickup. That's the plan right there. You prefer to have a neck pickup, and you have one. Use it. It's going to look great with the black guard. If the day comes for it to be sold, you can make it historically correct. In the meantime, enjoy it to the fullest. I've played a bunch of really cool Esquires, and I've never gotten zapped by that special Esquire charge that the Esquire fanatics love so much. I never hear the difference in the bridge pickup. I want the neck pickup.